A team of students at Université Laval just won first place for the third time in the Shell Eco-marathon in Houston with their svelte hypermiling supercar, which gets an incredible fuel efficiency of 2,564.8 MPG! The annual Shell Eco-marathon challenges high school and college students to design, build and test energy efficient vehicles, and the Alerion team have proven themselves to be masters at their craft. The prototype beat out the second place winners by a whopping 766.1 miles per gallon, and the vehicle even improved upon Université Laval’s entry last year by 77 miles per gallon. The mini cars aren’t meant for commercial consumption, as they aren’t exactly comfortable. On average, the entries accelerate to about 15 mph as they make laps around the 1km course. The idea here is not distance or speed, but total fuel efficiency. Team Université Laval won by a landslide with their Alerion vehicle. The supermiler consumed between 9-10.31 ml of gas on average for the 10 lap run, and the win scored the team a $5,000 cash prize. 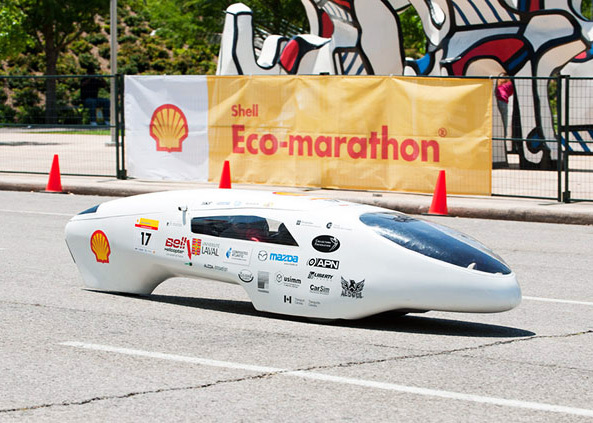 Shell’s Eco-marathon also challenges students to build other cars powered by other green technologies such as solar power, plug-in electric batteries, and fuel cell/hydrogen power. These innovative challenges and prototypes by young students set the stage for the developments of our future engineers. With any luck, these prototypes for energy-efficient vehicles will grow into realistic consumer products in the future. Actually, it's more environmentally friendly to use petroleum when it's this efficient. Mining the materials needed to generate and store electricity destroys the environment, and although electric vehicles are more efficient on average than petrol they're not as efficient per-mile as this prototype racecar. So... that's why they used gas.